Guérande (Breton: Gwenrann, literally "white land") is a town in the Pays de la Loire (Loire-Atlantique department) in western France. "Ville et pays d'art et d'histoire" since 2004, Guerande is famous for its medieval town. It is one of the rare cities to have to preserve his ramparts in its entirety. Guerande, it is also its Salt Marshes and her famous salt, "la fleur de sel". Guerande is a medieval fortified town. 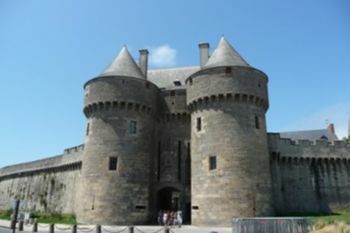 During Middle Ages, Guerande was the principal town in the estate owned by dukes of Brittany which covered the entire peninsula, the "Presqu'île Guérandaise". Its strategic position at the top of a hill gave it an overview of the ocean and a role as protector of the Salt Marshes. The town entered a golden age with the last dukes of Brittany, who built its formidable ramparts. The period gave it charm, a picturesque flavour and an exceptional heritage which led the celebrated writer Balzac to describe it thus "Guérande is one of those rare towns to have retained the true physiognomy of the feudal centuries". Nantes - Guérande by car : 1 hour (80 km approx). Wherever you are in the departement of Loire Atlantique, you can travel for only 2€ per journey. Another way of getting around is Métrocéane . This ticket allows you to travel by train, bus and tram. Each ticket is valid only for 24 hours. In 1343, following the destruction inflicted on Guérande by troops commanded by Charles de Blois, Jean de Montfort demanded that the town be properly protected by improving its fortifications. Work started soon after and continued for more than a century, with the town's architecture adapted to reflect the latest artillery developments. It was not until 1488, or 145 years later, that these ramparts, by then complete, were inaugurated during the reign of Duke François II (father of Anne of Brittany), a few months before his death. 1434 m long, the ramparts are pierced by four gateways : St Michel to the east, Vannetaise to the north, Bizienne to the west and Saillé to the south). One of the main site of interest of the medieval town. XV-XVI century. An area of 2000 hectares divided in two zones, the largest is around the Traict du Croisic and extends over the villages of Batz-sur-Mer, Guérande, and La Turballe. The second is located beyond the “coteau” guérandais and covers an area of 350 hectares which includes Mesquer, Saint-Molf and Assérac. This area is classified since 1996. Today in the salt marshes, around 250 “paludiers” i.e. salt workers harvest approximately 12000 mt of salt a year. It was one of the first natural parks to be listed as a “Parc Naturel Régional” in 1970. Visit the wetlands of La Brière: The wetlands of La Brière are not like the Salt Marshes. There are many ways to discover this territory but the most popular is the visit in chaland (craft). Discover the history of the region: Many sites enable you to understand the history of Guerande and its area with the help of museography, exhibitions and many other ways. There are 2 marketplaces in the medieval town: the great market on Sunday and the little market on Wednesday (the fishes's market is everyday except Monday and Thursday). Each year, the city organize "the Medieval Party" on May. This page was last edited on 24 March 2015, at 08:48.